Our home lies on a beautiful secluded beach just 10 min south of Zihuatanejo/Ixtapa airport called Playa Blanca. We are villa 4 of 24 villas in a 2 acre gated complex that offers 24 hour security. This private piece of paradise gets you away from the crowds and high-rise hotels for a real vacation escape. Keep in touch with unlimited wifi, close enough to the tourist action when desired but away from it all for quiet relaxing stay. Upstairs houses the master bedroom with a king size bed, a front balcony, a rear balcony and a full bath with shower. The second bedroom upstairs has a king bed that converts into a two single bed configuration with its own full bath with shower. The third bedroom on the main floor also has a king/2 twin option and a full bath with shower. All villa bedrooms face the pool and 2 acres of manicured lawns and tropical gardens as well as the beach and ocean. Main floor features a living room w/ 2 couches and a chair to enjoy the 50" TV with dvd player, dining table for 6-8, fully appointed kitchen (my husband loves to cook!) and our favourite place, the palapa covered patio housing the bar and beer fridge with the ocean and pool view! At our villa you are close enough to hear the waves breaking nearby and smell the salt air while enjoying unsurpassed views of the Pacific. 10 miles of secluded white sand beach. From our palapa covered terrace or the infinity pool watch dolphins playing in the surf and migrating whales breeching in the bay. The villa accommodations combined with its location takes you away from the mainstream tourist area and gives you a chance to enjoy Mexico. The local people and community give you that "small town" feeling and treat you like friends or family. Simply take a stroll to the end of Playa Blanca to Barra de Potosi. Here you will find a few small stores and countless 'enramadas' (palm thatched covered restaurants) lining the beach. Everyone is friendly so feel free to relax in a hammock, have a drink and enjoy fresh seafood at extremely reasonable prices. You can kayak or paddle board on the bay or in the lagoon threw the mangrove canals. Rent a surf board and catch a few waves. Horseback ride on the beach or explore a part of the jungle and the "turtle" beach on the other side of the hill. Take a guided boat tour of the large estuary and see the salt-producing flats and many exotic forms of local wildlife! Try your luck at the Morros with a fishing tour, or head out further for a sailfish or marlin! Camera's is a must! There are a few 4-5 star restaurants within walking distance that offer breakfast, lunch or dinner or if your feeling lazy simply order in! There are also a few small stores with the necessities. 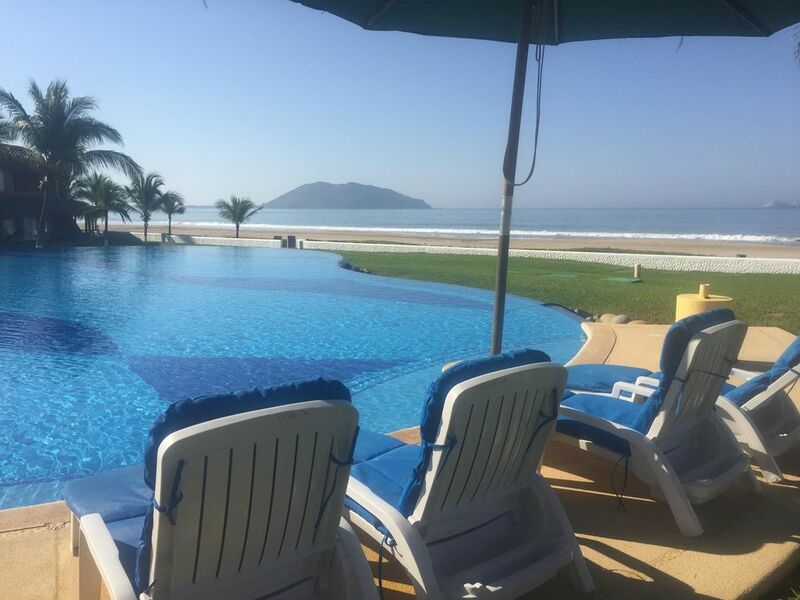 A 20min drive or cab ride to Zihua or 25 min drive to Ixtapa gives you many options for daily and evening entertainment and dining. Come experience all the reasons you vacation 'On the Beach'....Leave your cares at home and relax at Villa Playa Blanca. Thanks for considering our home. We have been enjoying our family vacations in Mexico for almost 25 years! We all love the ocean, beach, and atmosphere of Mexico. We chose this destination for our Christmas vacation 2010, and completely fell in love with the Villa and the atmosphere of the area. We noticed that Villa #4 was for sale, made some inquiries and voila! We have made so many local friends here it has become another home for us. Stunning beachfront property! 40 steps to the beach! Beautiful views from the Terrece and all bedrooms. The washing machine is for linens. If you would like some clothes washed, Please ask our housekeeper to do this for you. We appreciate that you tip her accordingly. Unlimited wifi for a nominal fee. daily maid service. Pool is close and super clean and only 50-60 steps to the beach.! 10 minutes to airport, good restaurants in the area and super quiet. This is my fifth stay at this property. it is just perfect! Thank you Lori :) !!! The villa was wonderful - very Mexican style as opposed to being Americanized. The grounds were very well kept by helpful staff who worked very hard to accommodate our needs. Since there were 3 ladies traveling together, we felt very safe in this gated community and recommend it highly if you want to relax. The taxi rides to town (shopping and restaurant areas) took about 10 minutes, but it was worth it to have only a few people around at the pool at night and practically no one on the beach. The restaurants within walking distance of the villa were very good. Thank you, Lori and Trent, and to Isabel, your property manager. This villa is a fabulous place to get away for a week or more. There were 4 of us ladies who came for our 55th birthday. The location is super close to the airport and getting a rental car at the airport is a great way to see the surrounding area. The unit was super clean and located close to the beach and the amazing infinity pool. The unit had AC in all the rooms so it's easy to keep cool at night. The kitchen is fully stocked and it was great to have wi-fi to keep in touch with family. We would definitely come again as this area is now our overall favourite in Mexico. Thankyou Karen. Loved having you stay! Exactly as advertised... just too isolated! This villa was the perfect accommodation for our family of six. Every bedroom had beautiful ocean views and our shaded patio was steps away from a gorgeous pool. The cleaning and maintenance staff were superb. There were a few needed repairs but they were taken care of promptly. The only consideration was the distance form Zi and the need for frequent trips for food and for fun as it is pretty quiet in Playa Blanca and the beach is not swimmable. If you want a super quiet get away and love waking up to the sight and sound of crashing waves, this is the place for you! Our vacation was an experience of a lifetime! It exceeded all our expectations. It's a perfect place if you want a relaxing vacation and for all ages too, families or couples. A spectacular beachfront property, located literally steps from the ocean, with welcoming breezes 24/7. The villa is exceptionally clean with a meticulous maid, [Deanna] and fully furnished for at-home comfort. The beautiful Mexican decor, spiral staircase, spacious rooms and super comfy king beds set the mood for R&R. The peaceful countryside location, super fresh air and rhythmic ocean waves made for great sleeps - well rested and ready to take on another day of exploring and activities. Enjoyed daily exhilarating beach walks followed by cooling dips in the amazing infinity pool & then relaxing poolside. No pool crowds, our own loungers with umbrella and fresh cut coconuts were a treat. New comfortable patio furniture, special outdoor bar fridge, WIFI, Cell signal, Cable, Roku, and DVDs meet your every desire. Breathtaking sunsets are plentiful! The groundskeeper and security personnel were friendly and helpful. We felt very secure in this gated community. We rented a car and were comfortable in traffic. 15 min to airport & a few more to Zihua and Ixtapa. It was fun eating at the locals in Barra de Potosi, especially when your Spanish is nil. The food was excellent and the price unbeatable! Met some great people too. It was a most satisfying and memorable vacation experience. Can't wait to go back!! Huge thanks to Lori and Trent for their professionalism and customer care with our vacation. Thank you for this review! We are so happy that you loved it and had a fabulous vacation!